On my run home on Friday, I stopped by Skinny Raven , and picked up a pair of New Balance MR00. Running Times has a review here, but it’s pretty brief. I tried on the MR00 a couple weeks after they hit the market, around the same time I bought those slices of blue and black sponge cake masquerading as running shoes (Brooks Pure Flow). They fit my feet pretty well, despite having a bit of an elf-boot last. So far, I’ve only got about 10 miles on the shoes – I raced in them on Saturday (3.1), and ran home in them yesterday (7.5), so the jury is still out of course, but here are my initial impressions. New Balance calls them “zero-drop” but Running Times says they have 1.6mm if drop; I couldn’t care less whether it’s 0 or one-point-whatever. The fact is that these shoes are very minimal when it comes to heel-toe drop, and I feel it when I run in them. In fact, yesterday, for the the first couple of miles, I felt some initial lower leg fatigue similar to what I recall from running barefoot or in my Vibram FiveFingers. I’ve been running in the MR10 for over a year now, and even the transition from the 10 to the 00 is quite noticeable. The ride? Well, that’s interesting. I expected more of a race-flat feel, but what I’m getting is an ultralight trainer (6.4 oz) feel instead. Odd, right? 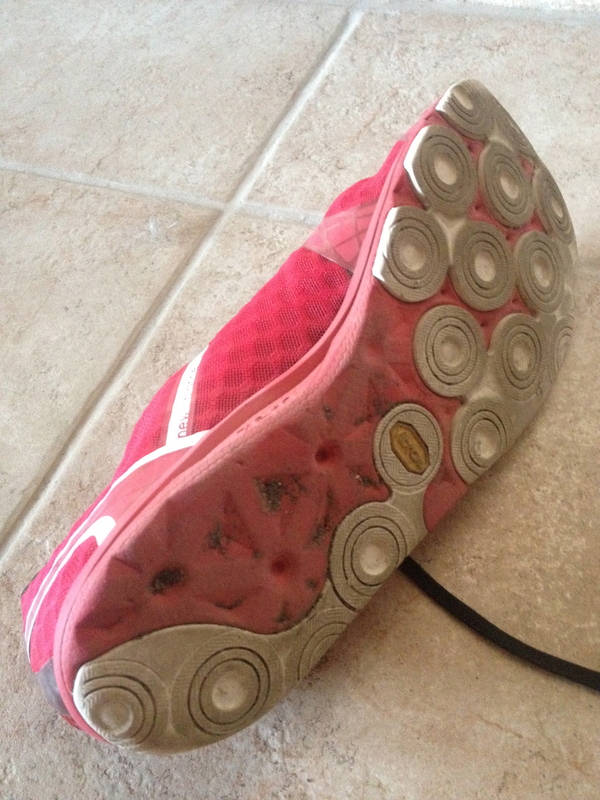 While I raced in them on Sat, they just didn’t feel like racing flats, like my Asics Piranhas. They feel a little more stiff, and little more dense underfoot. I’m telling you – I need to do some more research on what New Balance is doing with their midsoles vs. everyone else…I’ve been terribly impressed with their ability to create minimal shoes that don’t ride all sloppy. For a guy my size (5’11”, 184lbs), a solid midsole is critical to achieve good proprioreception. The outsole is done smartly. Vibram rubber only where you need it, and nowhere else. It’s a good idea, nothing new really, just running the midsole as an outsole in certain places, but it keeps it light. The sacrifice, and there’s always a sacrifice, could be anticipated in shoe service life. I bet these bad boys don’t last me 300 miles. Anyway, that’s it for now. Gotta run. I’ll let you know what I think as I put in some more mileage. If I took dozens of artsy photos of my new kick reviews, but never actually ran in them…I’m sure this blog would be, like, super popular. Check out the outsole Vibram pattern. Ideal for a mid-forefoot strike. Are you wearing socks with these? Do they fit true to size or did you have to size down? I wear socks, but you don’t really need to, I just have some spots on my heels that like to blister. Not sure if they run true to size, but I wear 12s for both the 10 and 00. I’ve been running in the 890s. I’m afraid to ditch too much cushion since so much of my running is on concrete. You’re right about NB, they have the best midsole right now. Nike, Saucony, and Asics seem to be getting softer. Overall, I think NB shoes run a tad bigger than most other brands. runningwarehouse.com has a pretty cool shoefitter tool that allows you to compare different shoes to get an idea of sizing differences.